Whether your service business is big or small, optimizing your dispatch process is one of the most effective ways of increasing your efficiency. Our Dispatch Map system gives you a visual representation of where your technician's routes and allows you to optimize jobs with simple drag and drop motions. Aside from the Callsheets themselves, your most favored venue in ServiceDesk will undoubtedly be at what might be called the dispatcher's "Command Central," a place where you can see and manipulate every important detail of every day's schedule, for all your technicians, and at a mere glance. 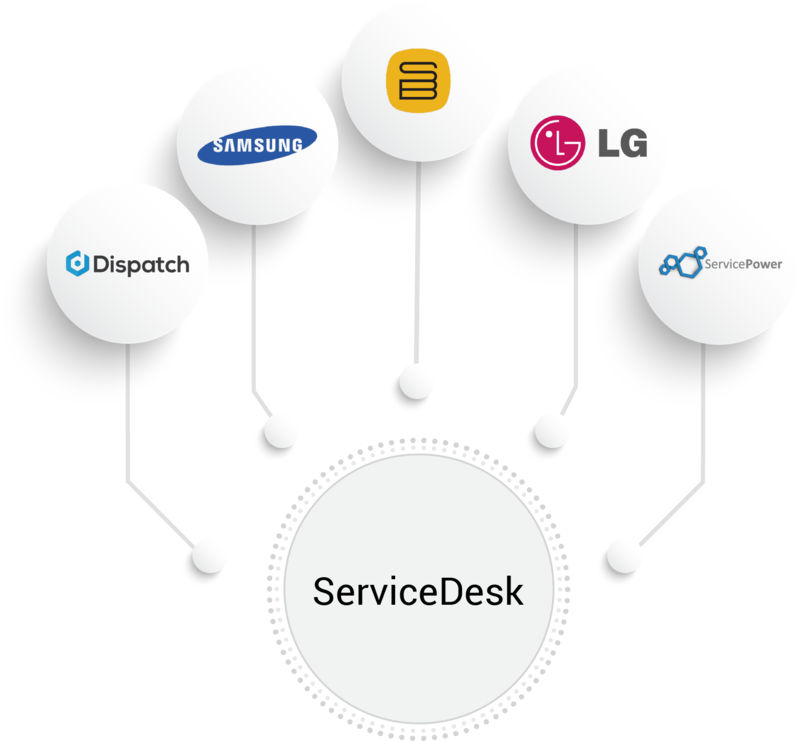 ServiceDesk provides two different means for viewing and manipulating your schedule. The first (discussed immediately below) is intensely graphic, showing each item from the schedule in its precise relationship of time and geography, and allowing manipulation of each item as needed from such a standpoint. The second (to be discussed in the following section) is textual instead, and allows the manipulation, obviously, of textual details. Every DispatchMap is a customized view of your unique service territory. All scheduled jobs are positioned properly on the map allowing for easy assignment to each applicable technician. It is as simple as dragging and dropping. To be maximally useful, your DispatchMap visually conveys not only each of your appointments, their times, locations and the techs to whom they are assigned; it also be indicates the status of each such job. Keep these third parties informed of your availability status -- so they know, for example, you are available for adding appointments at a certain set of zipcodes for next Thursday, but not for Friday, are again available on Monday, etc. For each dispatch any such third-party has for you, they automatically take all the dispatch information and insert if perfectly into ServiceDesk (from whence you can then easily manage each job). For each dispatch that you recieved and are managing, they keep the respective third-party informed of each change in status (e.g., change appointment, tech is on the way, tech has arrived, parts ordered, parts arrived, seeking to reschedule, jobs completed, etc.). How many techs do you manage? $0 savings for having fewer than 11 techs. $0/mo savings for having fewer than 11 techs.